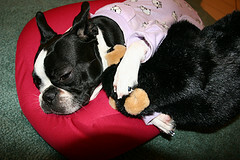 Boston terrier gifts has dog beds, dog bedding,dog pajamas and dog crate pads for the Boston Terrier dog. Nighty Night little Boston! Bed Time for the Boston Terrier is very important. Bostons love a soft warm place to snuggle up in or under when they go to sleep. Each Boston Terrier should have their own special dog bed to snuggle up in. Plush comfortable dog bedding is the best for the Boston. 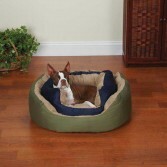 Choose from several styles and materials for a comfortable dog bed for your precious Boston Terrier. 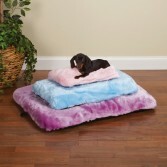 Click on the pictures below to see a full page to see a larger version of each dog bed or dog bedding. 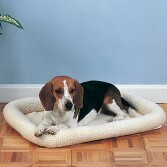 Slumber Pet Sherpa Beds Provide Greater Resting Comfort for your dog. Unique bumper style crate mat combines thick sherpa and bumper-style cushioning. Bed dimensions are slightly larger than ProSelect Crate dimensions so the bumpers are supported by the crate, softening crate's edges and providing an inviting nestling area for dogs. High-quality sherpa stays cool in the summer, holds heat in the winter, and is completely machine washable. The Miracool Mat makes a great cooling pad on hot days and a heating pad on cold days. This unique pad helps keep dogs cool on hot summer days and insulates dogs from cold floors in the winter! Can be used in a crate as well. Water-activated crystals keep mat cool for days with one 30-minute soaking in cold water. Guardian Gear Pet Cots are cozy, waterproof cots lift pets off the cold, damp ground. Replacement covers are available in other patterns. These Elevated Pet Cots protect pets from uncomfortable cold, hot, damp, and uneven surfaces. 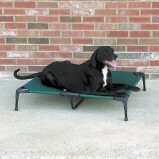 Lightweight cots allow air to circulate beneath dog for a healthier, more comfortable rest. Provides comfortable support for arthritic or geriatric dogs. Spring locks on each durable cot allow assembly and disassembly in seconds without tools, making it the perfect go-anywhere bed for travel and camping. Fabric is heavy-duty polyester oxford, water resistant, and is UV-resistant deep green polyester. Cover is removable for cleaning. Frame is constructed of powder-coated, rust-resistant steel. Velcro along sides allows bed to be stretched or relaxed for customized tension. Comes in Blue with Black. Our Slumber Pet Pawprint Crate Mats reverse from cozy berber to soft plush for versatility and style. Special thermal lining keeps mat cool in summer and warm in winter for year-round comfort. Attractive pawprint design on a neutral Ivory background looks great in any decor. Machine washable for easy care. Designed for use in ProSelect or similar-sized crates or can be used alone.